It’s unmistakable. Organizations both big and small are moving to Big Data because of the information they can gather and leverage. This data is so valuable because of the insights it provides and its ability to better position the company with the customer as well as the board. But these are not the only groups that are interested in Big Data. Criminals, miscreants and evildoers are also interested in getting their hands on this information to exploit credentials and other secret information for their own gain. 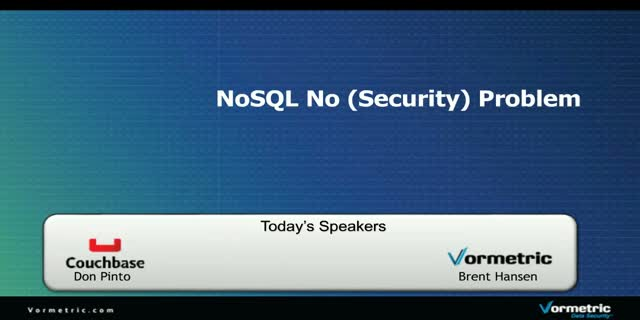 In this session, we will discuss the common security issues that companies must deal with when moving to Big Data, as well as key steps you can take when deploying NoSQL to ensure that Big Data works for you rather than opening additional vulnerabilities in places you may have never considered. Digital transformation is business enhancing and fraught with danger. With services moving online and into the cloud, the result is a faster, more agile and open service for consumers and enterprises. However, this digital transformation is taking place in an increasingly precarious environment, more and more your corporate attack surface is being exposed. With data breaches at an all-time high and incidents of identity theft risen by 57% in a year, consumers are questioning the security of their personal data held by organisations. The rise of cloud and the Internet of Things, has forced companies to take control of their data – regardless of where it resides and in addition, reputational damage caused by public breach is firmly on the agenda of the board. • The benefits of maximising the level of control over data irrespective of where it is created, store or shared. Digital transformation initiatives and increased threats have put enterprise data at risk more than ever, with 67% already experiencing a breach, and over half of those breaches in the last year. In this webinar Garrett Bekker, Principal Analyst for Information Security at 451 Research, details critical findings from the 2018 Thales Data Threat Report around the rise in data breach rates, what IT security pros around the world are doing to respond, and best practice recommendations for how to keep from becoming another statistic. GDPR is coming into force in May 2018. Many organisations are now getting into gear in order to ensure they are compliant by the deadline. This is even more important for those organisations who are hosting their data off premises. But what does GDPR really mean to businesses, how will it impact the way in which organisations handle their data and engage with trusted third parties? Join Verisec and Thales and gain a deeper understanding into how you can review your data security in an efficient and effective way to enable your organisation to focus on the truly challenging areas of data security and compliance. Sensitive data continues to make it into a broader set of environments, including cloud deployments, big data platforms, virtualised systems, and more. The policies and regulatory mandates in effect continue to grow more stringent. At the same time, these groups have to guard against more sophisticated cyber-attacks, and the continuous threats posed by users that have stolen privileged user credentials. To adapt to these expanding demands, IT and security professionals have to leverage technologies that offer a strong mix of security, implementation flexibility, and operational efficiency. This introduction is aimed at those within your organisation looking to gain an insight into data protection and the potential challenges that your organisation could face. Datensicherheitsvorfälle. DSGVO Risiken. Daten in der Cloud, Big Data und das Internet der Dinge (IoT). Was erleben Unternehmen in Deutschland und wie gehen sie mit den Herausforderungen um? Basierend auf der Forschung des renommierten IT-Marktforschungs- und Beratungsunternehmen 451 Research zeigen die Ergebnisse des Thales Data Threat Reports 2017 wie Unternehmen in Deutschland auf die Herausforderungen in Bezug auf ihre Daten reagieren. Diese beziehen sich auf die gestiegenen Anforderungen an Daten um das Geschäftswachstum zu unterstützen, und gehen bis hin zu regulatorischen Anforderungen, die Implementierung fortschrittlicher Technologien sowie Datensicherheitsvorfälle. Die Risiken für vertrauliche persönliche Informationen, Finanzdaten und kritische Unternehmensdaten steigen. Dieses Webinar behandelt die Sicherheitsbedrohungen in Bezug auf Daten für Unternehmen, was Organisationen machen um Daten zu schützen, und praktische Empfehlungen für die Sicherheit von vertraulichen und sensitiven Daten. • Die Auswirkungen von fortschrittlichen Technologien wie Container, IoT, Big Data und die Cloud und welche Herangehensweisen gebraucht werden um dort kritische und sensitive Daten zu schützen. • Die Art und Weise, wie neue Datenschutzregelungen die Strategie für Datensicherheit beeinflussen. New York State Department of Financial Services(DFS) has enacted rigorous, first-in-the-nation cybersecurity regulations for financial institutions and others that do business in the state. It is clear that regulators are raising the bar for the security of confidential and sensitive data. August 30 2017 is the first milestone date for this regulation. What is the state of your compliance? Controlling encryption keys — and thus your data — while adopting cloud services is one of the more difficult puzzles in moving to the cloud. Customers need to know if there is a consistent way to handle this across all their cloud services. In this webinar Adrian Lane (Securosis) and Vikram Ramesh (Thales e-Security) will discuss challenges specific to multi-cloud key management and why customers may need something different than the native encryption options offered by their cloud providers. They will help you select the right strategy from the many possible combinations, how each customer requirement maps to different deployment options, and what to look for in a key management system. Just one year remains before enforcement of the EU General Data Protection Regulation (GDPR) goes into effect. It’s arguably the most important privacy regulation in a generation. But it’s time to move beyond mere awareness and understanding of what GDPR is, and start making decisions about how you’re going to address it. Doug Cahill, Senior Analyst, at Enterprise Strategy Group, Inc. The broad adoption of cloud applications has resulted in more and more data assets leaving the corporate perimeter and being stored in the cloud. However, many organizations need to retool their cybersecurity processes, skills, and technology to be ready for the Cloud First Era. This webinar will explore how bring your own key (BYOK) and Key Management as a Service (KMaaS) offers flexible enterprise-class data encryption capabilities to secure cloud-resident data and meet and maintain compliance with industry regulations. Doug Cahill is a senior analyst covering cybersecurity at Enterprise Strategy Group drawing upon more than 25 years of industry experience across a broad range of cloud, host, and network-based products and markets. Prior to joining ESG, Doug held executive leadership positions at security firms Threat Stack and Bit9 where he launched market leading products and forged strategic partnerships. Over the course of his career, Doug has also served in product management, marketing, and business development roles for cybersecurity, storage management, networking, and database vendors, and started his career in IT as a business analyst. The Internet of Things (IoT) has us now counting data elements in the trillions. Collecting, storing, and analyzing this data is transforming business intelligence. However, with this new capability, security is also essential. Teradata offers a best-in-class platform for IoT data processing, storage, and analytics. Together with Thales, the solution address the evolving business intelligence needs of enterprises, while protecting data elements and business intelligence. In this webinar, we will examine the key elements necessary to process IoT data, and the security aspects that enterprises need to focus on to safely harness the power of the technology. • The role of Hardware Security Modules (HSMs) in addressing cloud and enterprise encryption and key management use cases. Spending on IT security to protect data is up - sharply in some sectors – yet successful data breaches are also up significantly. Clearly, there’s still a big disconnect. In this webinar Andy Kicklighter with Thales e-Security, and four time prime mover behind the Thales Data Threat Report, reviews the detailed findings of the report. The 2017 Data Threat Report – Global Edition will be showcased with an emphasis about the data threats that enterprises are experiencing, what they are doing to secure their data and actionable recommendations that can be used today to secure their sensitive data from data threats. • What’s behind the big disconnect? And what should you be doing? Data security is not a one-size-fits-all solution. Data-at-rest should be secured in a variety of ways, depending on the use case, security policy, and regulation surrounding it. Modern enterprises need flexibility in how they apply data security, yet also need ease of management. Vormetric is a leader in data security, with a large global footprint of securing data in cloud and on-prem environments. Organisations in Australia now have a renewed focus and urgency on the protection of personal information assets with the proposed mandatory data breach notification laws back in the forefront of Australia Parliament priorities. With cybercrime and cyber threats exponentially increasing, organisations need to ensure their data security strategy is both comprehensive and stringent enough to deal with internal, external threats, audits and legislation. This webcast will explain and guide organisations in order to effectively prepare for the forthcoming legislation but to also better prepare your business to thwart the on-going cyber risks it faces daily. There is no doubt that virtualization can reduce complexity and cost…So are all organizations not fully adopting it? Studies show that the two major reasons that organizations have delayed virtualization initiatives is due to scaling and security/compliance issues. Join us for the insightful webcast where we will show how many organizations are tackling these concerns faster and easier than they thought possible. Come away from the webcast with your action plan on how you can start or continue your journey to the cloud without the challenges that may have been holding you back. With more organizations operating anywhere and everywhere, the question plaguing both business and IT titles alike is, how do I scale my infrastructure AND my security to keep up with the demands of my business. A more heterogeneous user base in more locations using more cloud based applications – both public and private - and transferring huge amounts of data. Is it even possible to ensure always-on capabilities while also being secure? Join us for this exciting webcast where we will talk about the security and scalability challenges that organizations face as well as the enterprise cloud concept – the new approach many organizations are turning to in order to ensure secure “any-to-any service”. Any app, anywhere, anytime, always secured. It doesn’t matter what industry vertical you are in or how big or small your business is, we are all plagued by the same concern, the security of your most valuable asset – your data. Moreover, the threat is sometimes the ones that you trust most, namely people that have access to your privileged information and data. This insider threat can be your customers, partners and even your employees that accidentally or purposefully release or acquire sensitive data and use it for something other than what it was meant for. Just imagine if you had a complete and panoramic scene sizeup along with the ability to proactively address potential threats of both the traditional threat vector of outsiders gaining information as well as the increasingly common and dangerous internal threat. Join us as we discuss this important topic as well as how you can ensure that your organization does not find itself in the eye of the security cyberstorm..
RSA has notified current users of End Of Product Support (EOPS) for their Data Protection Manager (DPM). Join us to hear about Vormetric's accelerated and proven migration for current RSA DPM customers to the Vormetric Platform.